It’s Wednesday! Time for some StuART! Sometimes I amaze even myself. Yes. I do try to give the peeps a nice photo pose every now and again. This one is especially nice. I think. The peeps think so, too. So, to the peeps I say, “here’s to y’all taking me with you on a little trip to Staunton last week (where the original photo for this StuART was taken when I was staring at a squirrel)” – but don’t get used to it. You gotta work for poses like this. Wednesdays are art appreciation days here at The Scottie Chronicles. And, of course, the art is all about me. 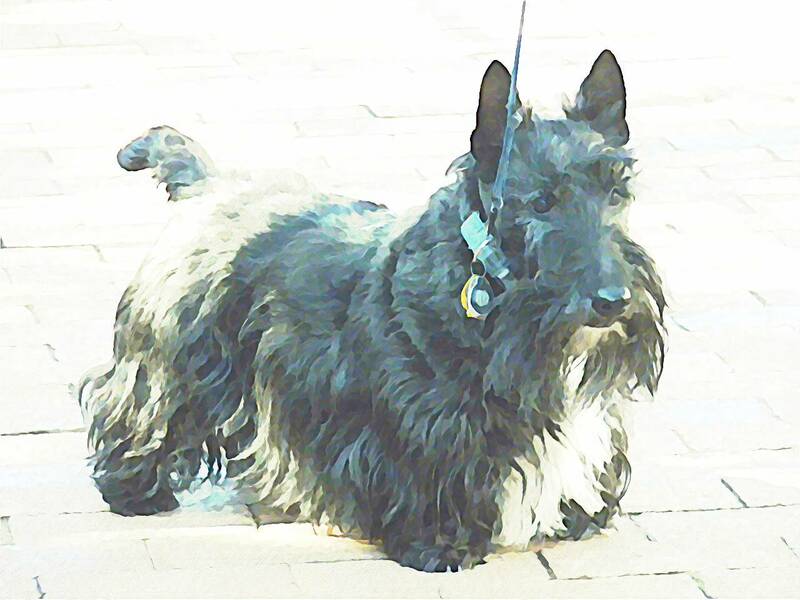 This entry was posted in The Scottie Chronicles and tagged art, dogs, photography, Scotties, show poses, Staunton. Bookmark the permalink. PAWSOME. I love this one. You look soooooooooooo handsome and regal. You are SO nice my Ranger friend. Did you get to chase the squirrel afterwards?? That is brilliant. I think it’s my favourite so far. Loving the pose! Are you certain that this picture of you wasn’t taken on your recent trip to Westminster? I promise. No. Though it does look like a show pose, doesn’t it? Spiffy. Now there’s a nice word! You look so handsome and dignified! Oh, you make me blush Casey! ArooOOO! Beautiful…another winner. Hope you gave the squirrel what for! I did boy! I really did! Hi girls! Stuart you have the perfect stature. Why I think you might even have a small grin on your face. Well, maybe just a small one! Stuart, you are one handsome lad! Have your Peeps ever thought about a modeling career for you? You’re a natural! And, did you know that today is “Love Your Pet Day” ? You could be the poster dog for this special day with that magnificent pose you got going there! You’ve got the look and all the love! Lucky Stuart! Well, thank you so much! And thanks for letting me know about Love Your Pet Day! You look like you’re heading to Westminster, Stuart! YIKES! Could you imagine me at Westminster? What a hoot! My friend you are a show dog!!!! Hey lil’ Hoke! Yep. That’s me. Top dog in the category of snoozing! I love this one Stuart!! So ready get that squirrel! You look very fuzzy in this one! The truth? I need a haircut!